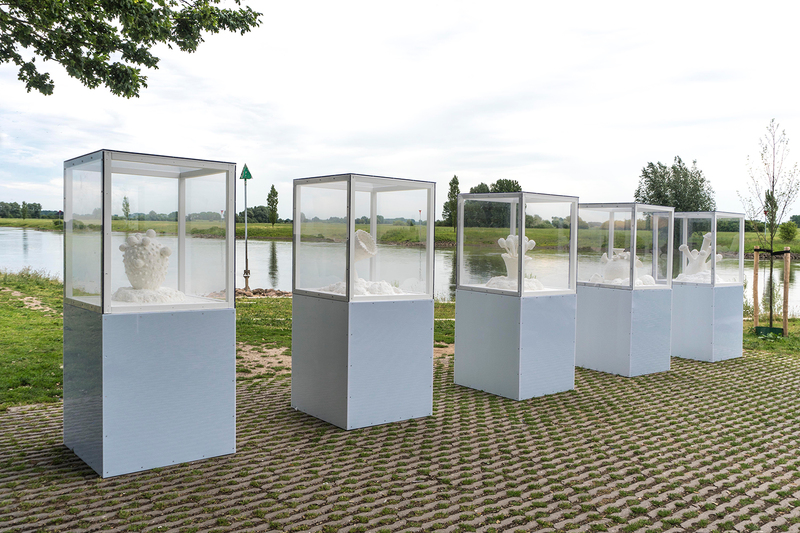 For over 20 years, Peter de Cupere has been using scent as a medium for his works. 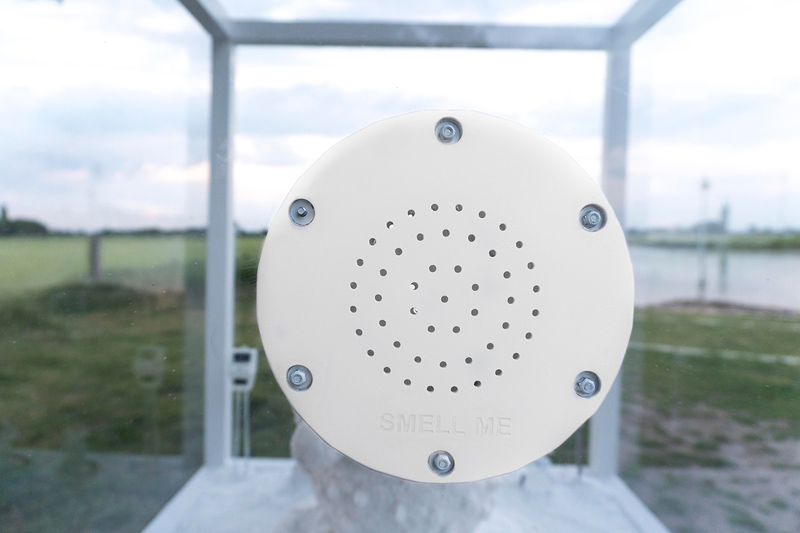 He is therefore also the olfactory artist who is most in demand worldwide. 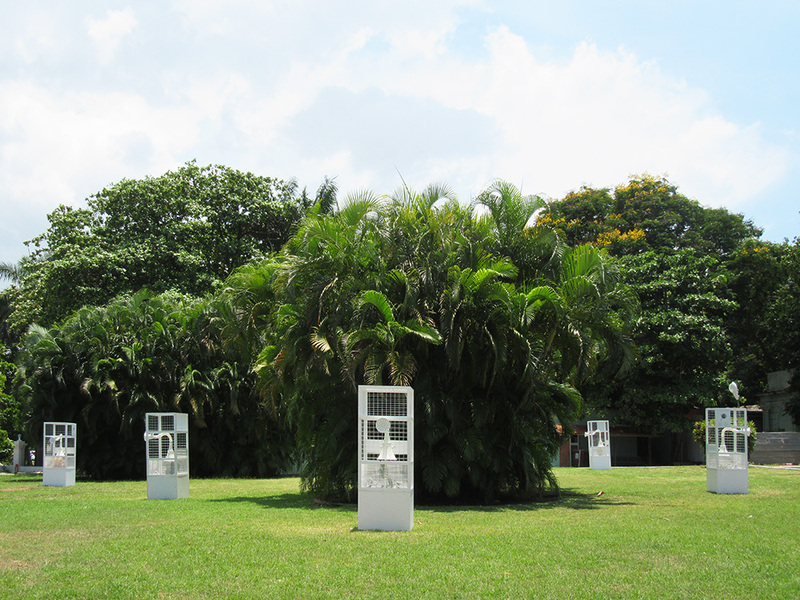 An ever reoccurring central theme in his works is the inquiry of climate change. 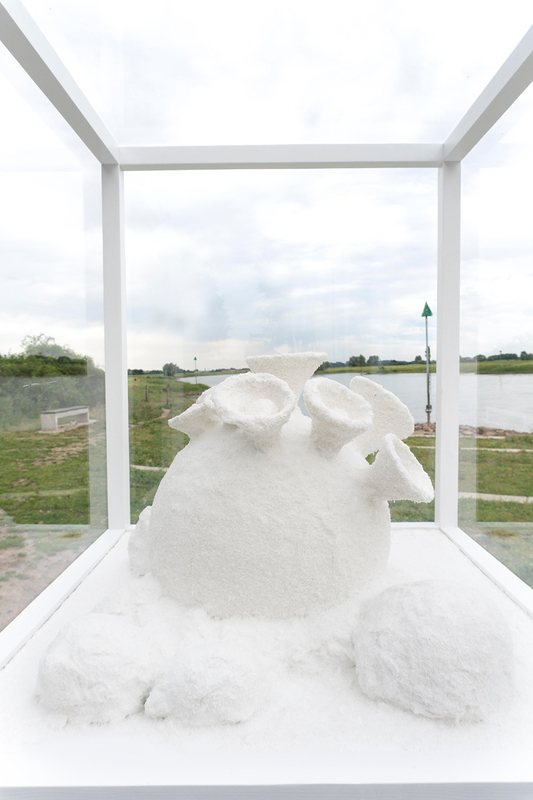 He thus created a very extreme work for the Ijssel biennial in The Netherlands, Salt Flowers. The world, our climate is changing and this is happening more drastically than we suspect. Men is fooling himself and only believes in the advantage of their proper economy and not in the advantage of human kind. 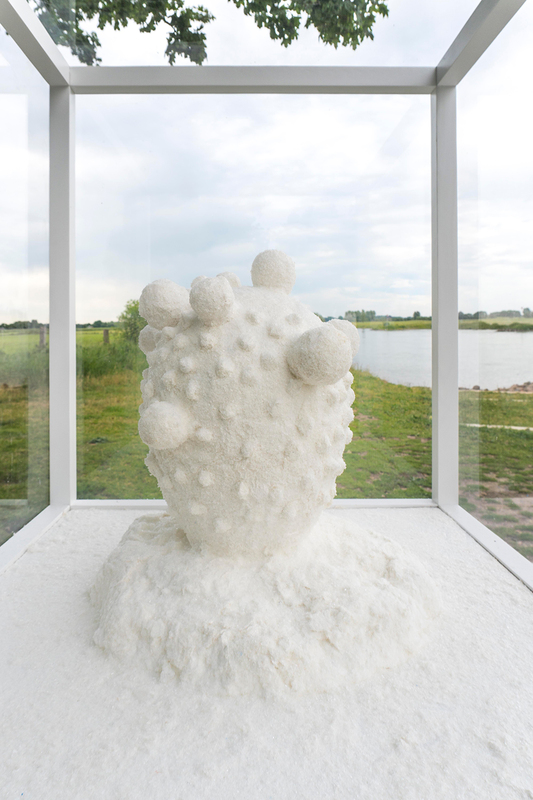 The Ijssel Biennial’s topic is climate change. 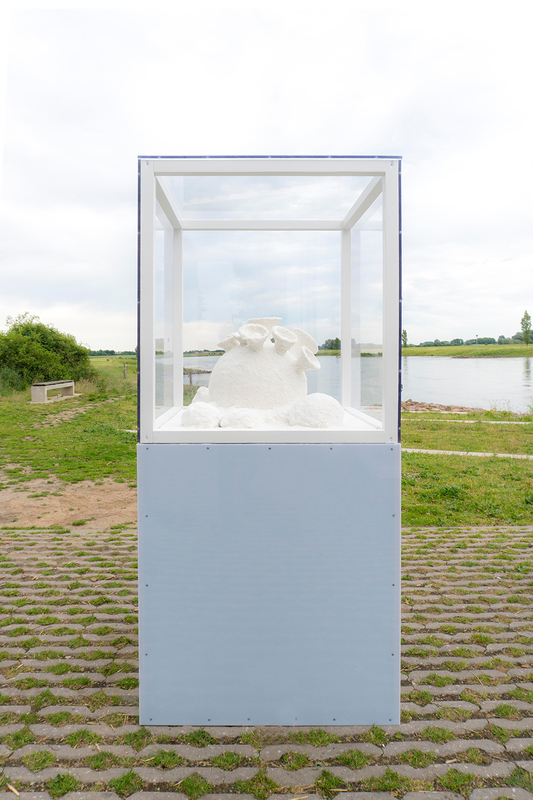 23 artists were asked to present their vision on the consequences of climate change on the river Ijssel. 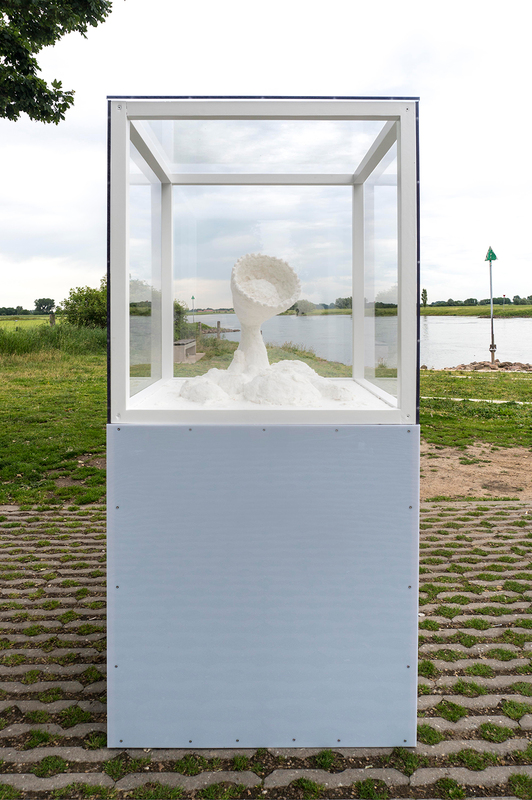 Peter de Cupere uses an extreme scenario which shows that the water level rises in such a way that the Ijssel Valley gets flooded with sea water. This kills the existing biodiversity. Sweet water becomes salt water. He looks for an utopic way of surviving particular to that situation. 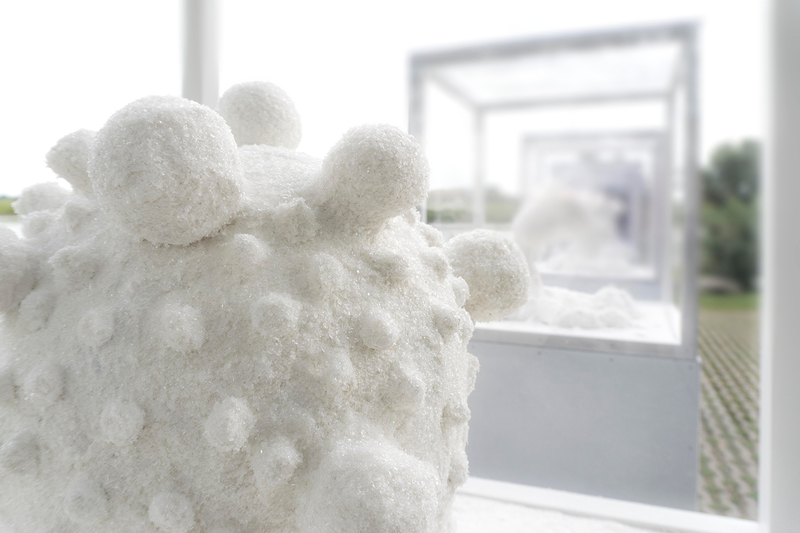 He replaces the by then disappeared white ice capes at the North and South Pole by white salt capes, won from the ocean. 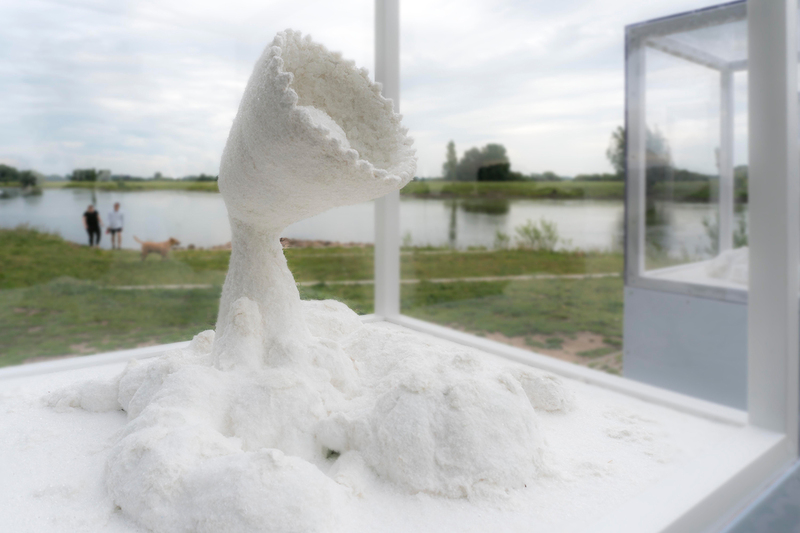 He presents a white salt nature with plants, fruit, vegetable and flowers created out of salt. They each have their own scent and thus a proper identity. 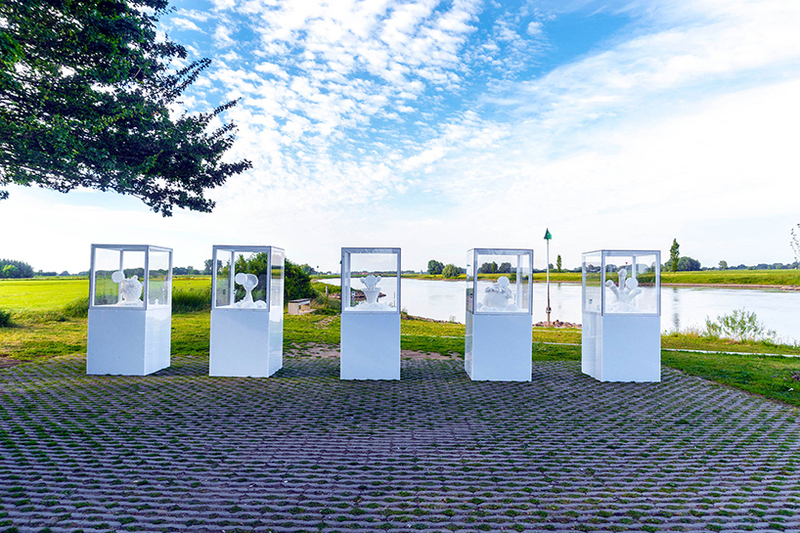 The 5 displayed Salt Flowers each have their own scent. Some do not smell that bad, sometimes even exaggeratedly fresh, others smell earthly and stink. 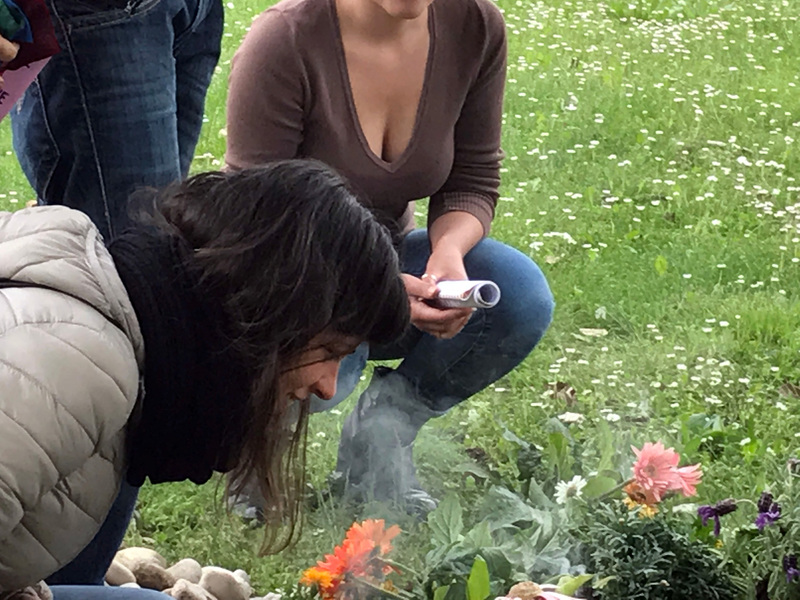 The strength of the work does not solely lie in the visual accomplishment of the flowers, but also in the choice of scents. 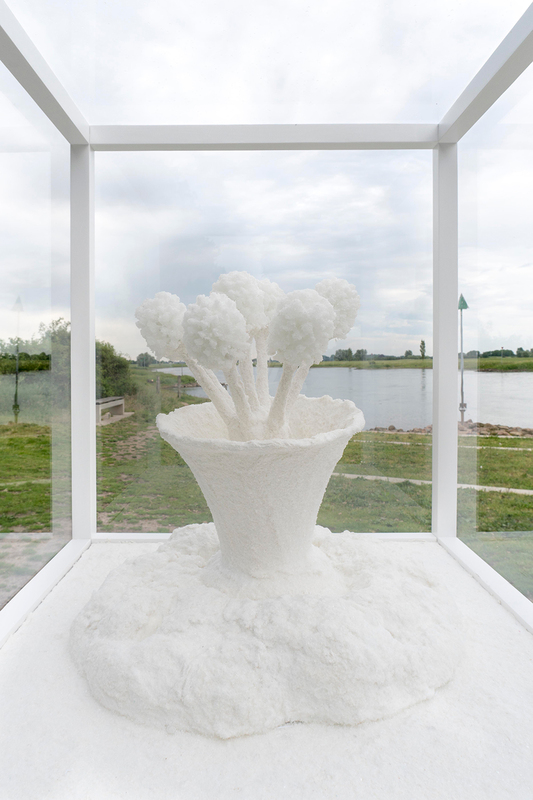 Visually, the flowers are aesthetically and virginally white and the grains glitter in the sunlight. The artist knew how to attach the small grains to each other to a steady shape. Even though the spectator can be persuaded one hundred percent that the flowers are made out of salt, they are far from the truth! 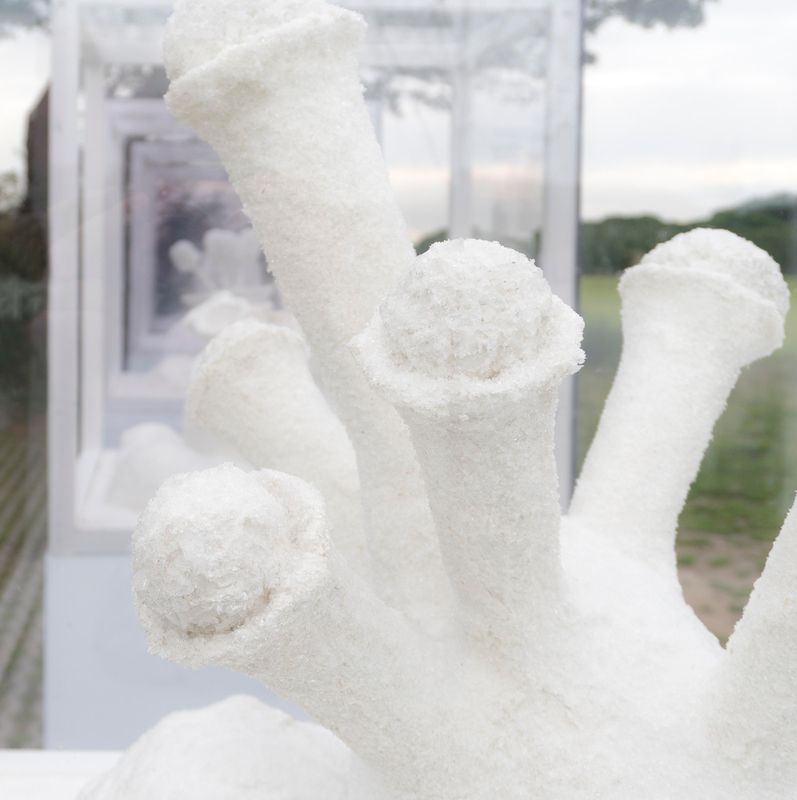 All the flowers are made out of glass grains. The whole work is created around perception. How do we experience things? How important is it to know what we see and observe? Because even the scents deceive. The wonderful fresh smells are in reality nothing more than WC fresheners and laundry products. They smell like flowers synthetically. And that is also what will remain in an extreme scenario if the climate change continues like this. But also the two other reeking flowers are a statement. One smells like organic nitrogen based on blood meal which is used as a fertilizer and the other like food for sturgeon (a type of fish). Two unpleasant smelling, or just say reeking scents. 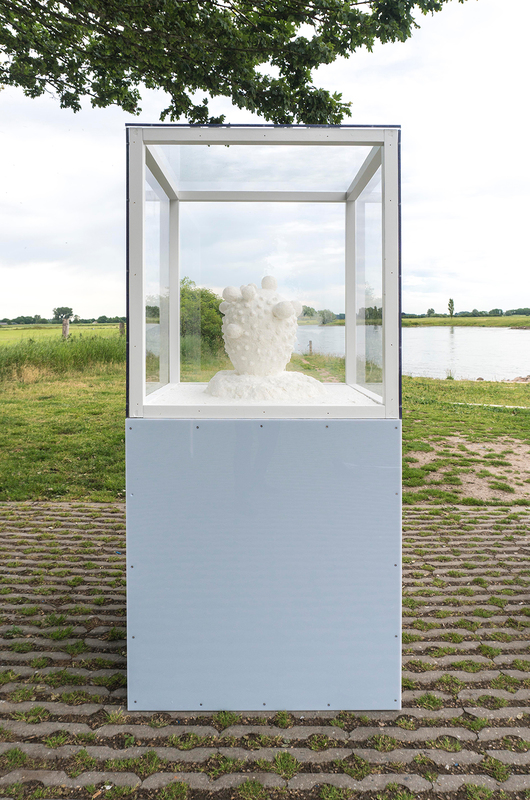 With the idea of ‘what you give is what you get’, the artist is thus questioning our environmental policy and economy. 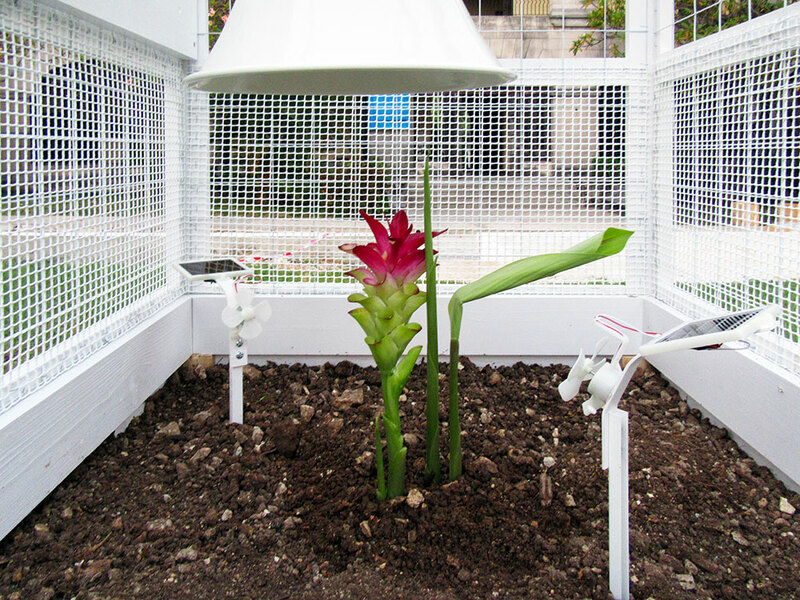 Both have an influence on the breeding result of fish and the cultivation result of plants. It is well known that too many fertilizers are being used, but also the overcultivation of fish is not positive for the fish maintenance. 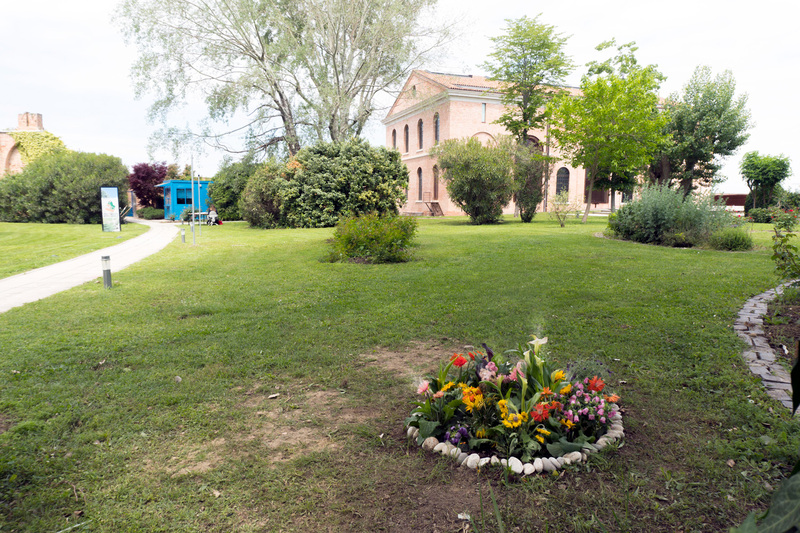 Salt Flowers allows the spectator to experience olfactory what a possible result might be of our daily use of synthetic products (scents) and extravagant use of fertilizers and nutrients, a world in which we do not find any purely natural products. It seems to be a far from our bed show, but we encounter it every day in our daily life. 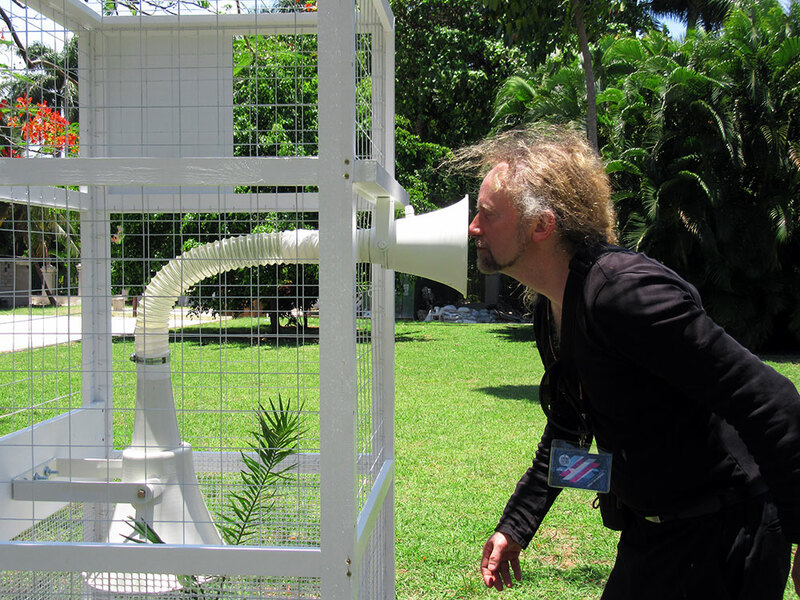 The artist thus hopes that we will stop in time with letting us be deceived by multinationals who try to push us into synthetic cheap products. The synthetic lavender smell of one of the flowers does not come near to the same health quality as the true lavender scent in nature. 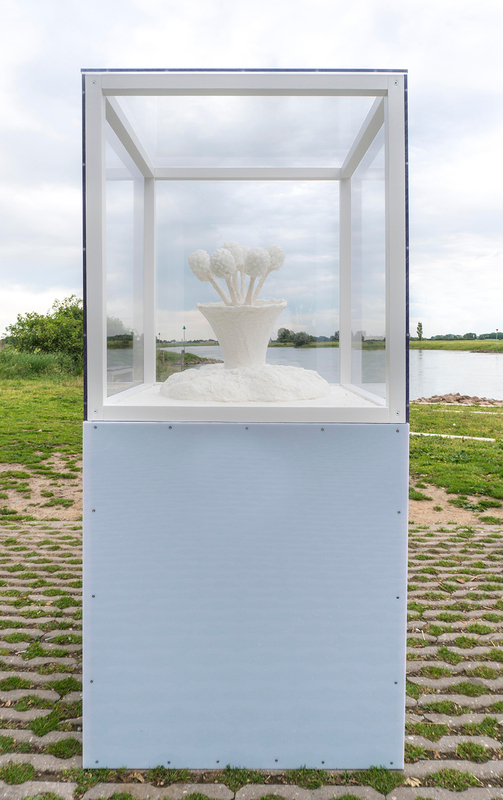 With Salt Flowers, the artist points out the necessity of a decent climate policy. 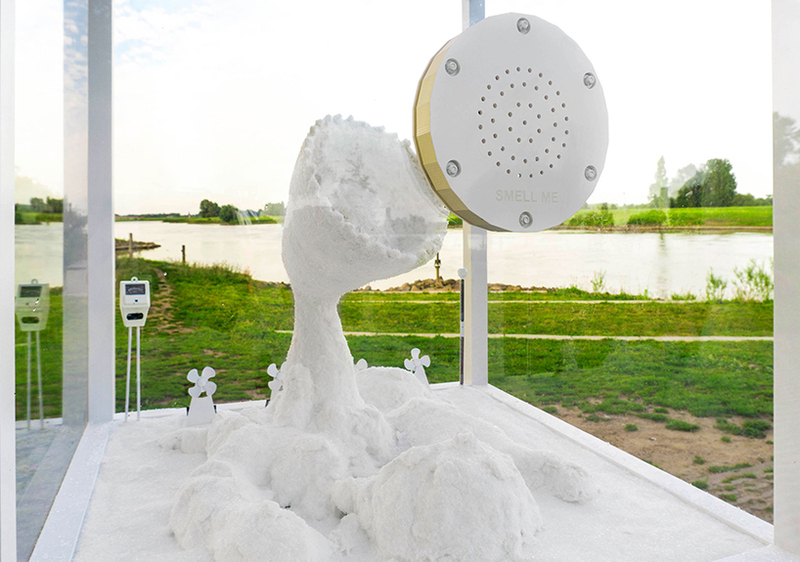 For those who want to see and especially smell Salt Flowers, they can visit the Ijssel Biennial in The Netherlands until 23 september 2017. More information on www.ijsselbiennale.nl .